Since the release of the Apple iPad in 2010, dozens of tablets have flooded the market for both personal use and education. With multiple operating systems and various hardware manufacturers, it can be a difficult undertaking to find the right tablet for your classroom. The task involves scouring the marketplace to see what is available, then determining which features are most important for you and your students. As with any purchasing decision, price cannot be the sole factor in choosing a device. Functionality, durability, battery life, memory, available apps and many other factors come into play when making the right decision. 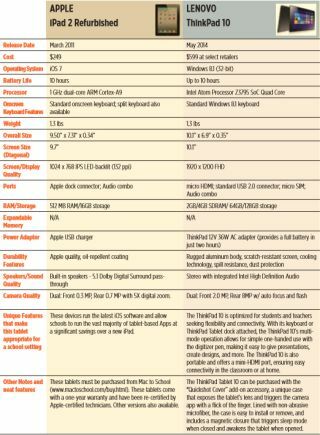 Included here are some of the top tablets currently on the market for education.